These four collages are ones that are not quite done, even though at first glance they may look like it. With all of those I've gotten to a place where I know they need something more, but I have absolutely no clue. I've got a rigid eye for balance, and these are not quite balanced to me. How do you deal with artwork of yours that are deciding to be mysterious? I posed this question over on Instagram, and many artists had wonderful words of advice about what helps them. @looksallylook says: "For me, I sometimes have to identify the thing I'm too "in love" with about a piece, and remove it in order to let the piece breathe." @hellskitsch says, "I tend to overwork things so it's best for ME to step back from time to time. Perhaps you just need a break? Go do something else and look with fresh eyes. Or look with tired eyes or drunken eyes or a reflection of the work in a mirror. Changing your perspective can be helpful. Or not. 😉 It's an art, not a science." @writeitonmyheart says: "When I'm stuck, I find that it helps to put what ever I'm working on someplace where I can look at it from a distance. The new perspective allows me to see my work as a whole instead of in sections and I can usually pinpoint where I need to add something or make changes." 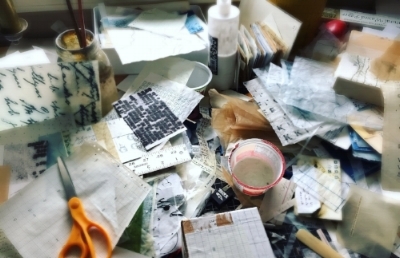 @twospotted dogs says: "I have a pile of my "stuck" pieces on my work table right now. One of the ways I work through this is to add, subtract or rearrange things an take photos along the way (I work in collage too). Looking at the photos gives me a chance to compare different options at the same time. Another trick I learned in art school is to try turning the piece upside down. If the composition is "off", it frequently seems obvious with a different perspective. Of course this only works if you have already glued the papers down! :)"
@donnajoy88 says: "I work on something else and come back to it later. Fresh eyes/time and i usually know just what it needs." @oliverneilsonart says: "I have a whole wall of unfinished pieces. Sometimes they connect together and 2 or more unfinished ones create a third, new piece.also when a year or so passes you can see things fresh and have an epiphany about it - either be ruthless with 'power tool editing' or 'white paint editing' , or it becomes obvious what the piece needs at that remove. The worst is when you add something down the line to 'finish' something that was already fine and it makes it worse. I did that twice last year. So what was once finished is now unfinished." @birdneststudio says: "Take a break and put them aside. Also, if you knit or stitch, or draw - do something completely different in between - it always helps me:) good luck:)"
@mirtya_arte says: "When we get stuck it is best to leave it aside,until thevplay speaks to us again..."
@ findsanddesigns says: "You just have to walk away (and stay away) for a while. These are looking great!" So helpful, and so individual. Do go check out these lovely artists' IG accounts! I've been bitten by the cyanotype bug again. I was hit by it hard last spring and apparently it's a spring thing for me! Cyanotypes are (according to wikipedia, since they do it better than me) "a photographic printing process that produces a cyan blue print. Engineers used the process well into the 20th century (i.e. blueprints) as a simple and low cost process to produce copies of drawings. The process uses two chemicals: ammonium iron citrate and potassium ferricyanide." You don't have to become a temporary mad scientist to use it. Kits are easily available online; Jacquard makes a good one called Sensitizer Set and I know there are other ones too. All you have to do is mix equal portions of the two bottles, and you're good to go. I use a foam brush, but a Japanese hake brush is often recommended. It really doesn't matter, as long as you get the results you want. You paint it on whatever paper you want. Use a paper though, that will hold up to the washing. I like to use medium weight printmaking paper, but almost any printmaking paper will work pretty well. You can prepare your paper inside, best under low light, I prepare a bunch, then let them dry in a couple of cabinets that have shelves. I can store them there until I want them-- you do want to store them in a lightproof area. Next step is to place the objects or transparency that you want to use on top of the paper, and sandwich it between a bottom layer, like plexiglass or cardboard, and place another piece of glass or plexiglass on top. I like to use glass because it's got some weight to it, so it really keeps the image tight against the paper. Place it in a sunny spot outside, and wait! When it turns a tan color it's ready; check the instructions on the kit for better info. I like to mess around with exposures and paper, so I'm not going for a crisp image. Once done, submerge the exposed paper in a pan of water and agitate it gently. Adding a little hydrogen peroxide to the water will help hasten the blue along. When blue, take it out, blot it, and let it dry. That's it! You can take it a step further with toning. Essentially you bleach the image to your desired state, and then immerse it in a bath of whatever you've decided to tone it with. For bleaching, washing soda, baking soda, and ammonia all work, but you'll get slightly different results with all three. Some things you can use to tone your images are coffee, black tea, green tea, and tannin. Jacquard has a really great downloadable PDF on toning cyanotypes, here. The length and concentration is up to you. I like messing around with the process, so at the moment I'm just experimenting with combinations. I'm not very scientific at it...I don't make notes. I'm just trying to make new papers I can use for my work. He has a really in depth PDF about the process, including the history of it. Cyanotype Process. Photographer's Formulary has a kit for that one. I don't really know the difference. The explanation starts to get a little too technical for me. I've ordered one, though, which I just received today, so I'll keep you updated once I've tried it. 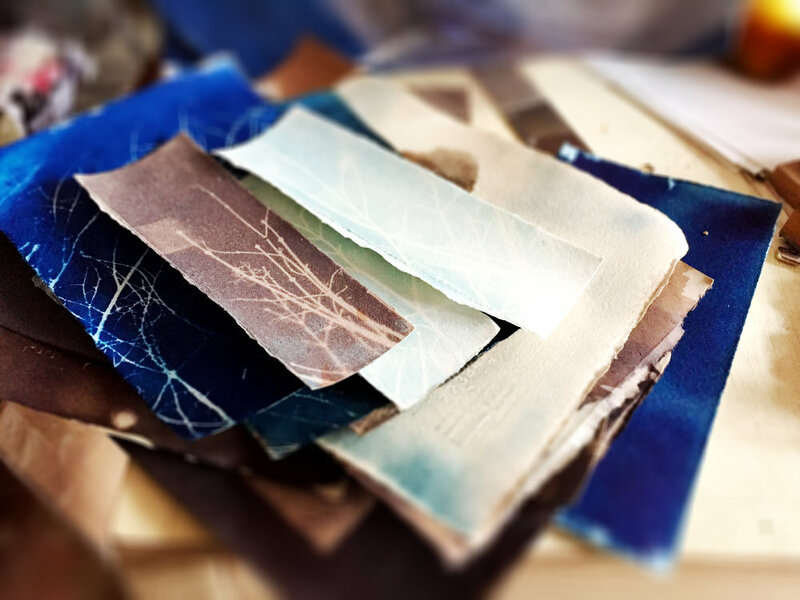 There's a whole store with cyanotype materials. I just stumbled across this, so I haven't looked through it, but it looks like you can get pretty much anything you need there. I've started a journey. Let me introduce myself. I'm Krista McCurdy, 35, and I live in Portland, Oregon. I dye yarn for Pigeonroof Studios and also am a Pilates Instructor at Studio Blue. Although I have a BFA in Printmaking, for the past ten years I've only done art sporadically. Moving to Portland gave me the space, both physically and mentally, to start making art again. It's a very different world for artists now than back then. The whole online marketing one's art and the many choices available, is completely new and a little bewildering to me. What I've come to discover (and been told) is that nowadays as an artist, one needs to brand themselves...and to get one's art as visible as possible! Using social media to help brand one's self is a wide, wide new world. I come across many artists with thousand of followers, who sell instantly the works that they put for sale on Instagram, and are generally very successful. These particular artists are always pictured perfectly coiffed and made up, in a carefully "artsy" clean outfit. Their studios are large and light filled and airy and magazine looking. Their work ranges from the good to bad usually leaning towards the latter. They are extremely successful. The usual state of chaos. But that's not reality. Reality is my cluttered worktable, in my office in my house which does not have picturesque hardwood floors, but carpet. My materials are strewn all over the place. I do my printmaking in my dye studio, which is two cards of our 3 car garage. This studio is definitely NOT picturesque! Total chaos. Reality is me, as an artist beginning again, so to speak, figuring out how to brand and sell myself without losing my soul. Join me on my journey down the rabbit hole. I'm going to be completely open about the setbacks and worries and, hopefully, joy. Selling one's art online, becoming noticed, doesn't happen overnight.